Friday’s Read-In event takes place at the Museum in the “Anne Frank: A History for Today” exhibit area. In order to engage readers of all ages in Big D Reads, companion books have also been selected, among them Dr. Suess’ Sneetches; Lois Lowry’s Number the Stars, and Eric Larson’s In the Garden of Beasts. These works are all available for checkout at the Dallas Public Library. 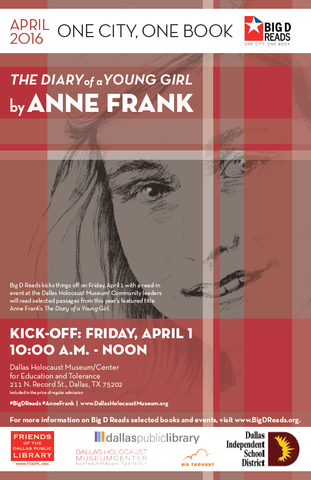 The Dallas Public Library and the Friends of the Dallas Public Library are organizing this year’s Big D Reads event in partnership with the Dallas Independent School District and the Dallas Holocaust Museum/Center for Education and Tolerance.